This blog was published at about 5:15am from my home in Indian Lake Estates, FL. Yesterday I enjoyed another long, easy swim of just under a mile and a short nap. I spent four solid hours working on the DPP 4.0 RAW Conversion eGuide. This post, which took me about 2 1/2 hours to prepare, makes 284 in a row. 365 is well within sight…. Tame shorebirds, herons, egrets, night-herons, terns and gulls plus tons of great instruction. Scroll down here for complete info. This image was created in LaJolla, CA with the Gitzo 3532 LS carbon fiber tripod, the Mongoose M3.6 head, the Canon EF 200-400mm f/4L IS USM Lens with Internal 1.4x Extender (with the internal TC in place), the Canon 1.4x EF Extender III (Teleconverter) (tripod-mounted at 655mm), and the Canon EOS-1D X. ISO 400. Evaluative metering +1 stop as framed in cloudy bright conditions: 1/500 sec. at f/9 in Manual mode. Head throws, usually part of the bill cleaning ritual of Pacific Brown Pelican are thought to be a form of intra-flock communication: one pelican talking to another. It is exceedingly rare to see a Brown Pelican of the Atlantic race do a head throw. On the other hand, the Pacific birds do them quite often. 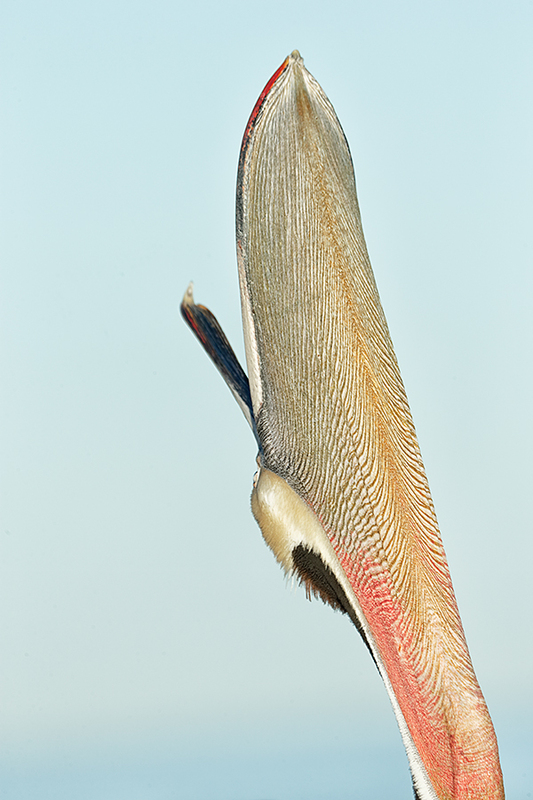 Head throw photography can be quite exciting and quite rewarding; one of my earliest BBC Wildlife Photographer of the Year Competition-honored images (I have eight in all), was a full frame vertical of Pacific Brown Pelican at the height of a head throw. You can see that image, cropped a bit too tightly by the original designer, on page 86 as a chapter opener and on the back cover of the original The Art of Bird Photography. Head throw photography is a huge challenge. 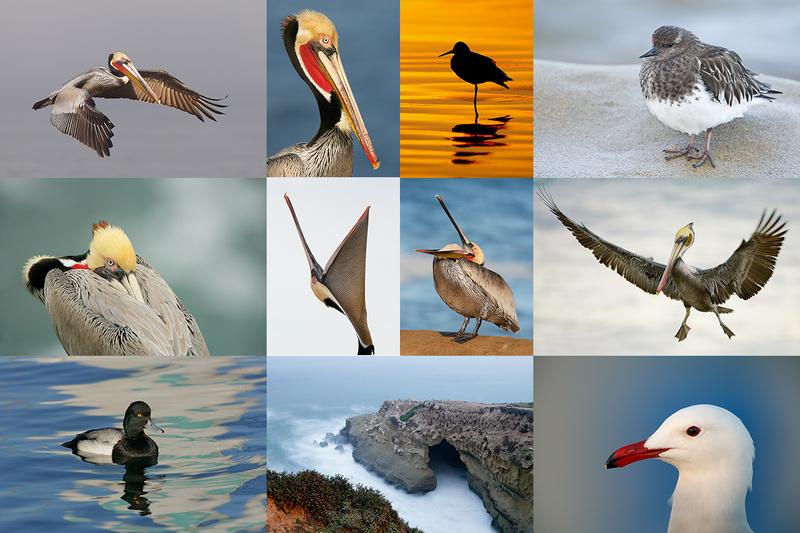 You might have as many as 20-30 or more pelicans sitting right in front of you at relatively close range; which one will be the next to execute a head throw? Are there any clues to which bird will be the next to show off? How do you position yourself to try to isolate your subject and come up with a clean background? What is the best lens? Should you use a fixed focal length lens or a zoom lens? Should you be in horizontal or vertical format? Should you include the whole bird in the frame, go for a head and shoulder vertical, or try for a tight bill portrait shot as in today’s featured image? Should you be on a tripod or hand holding? What sort of shutter speed should I be using? Is one time of day better than another for head portrait photography? 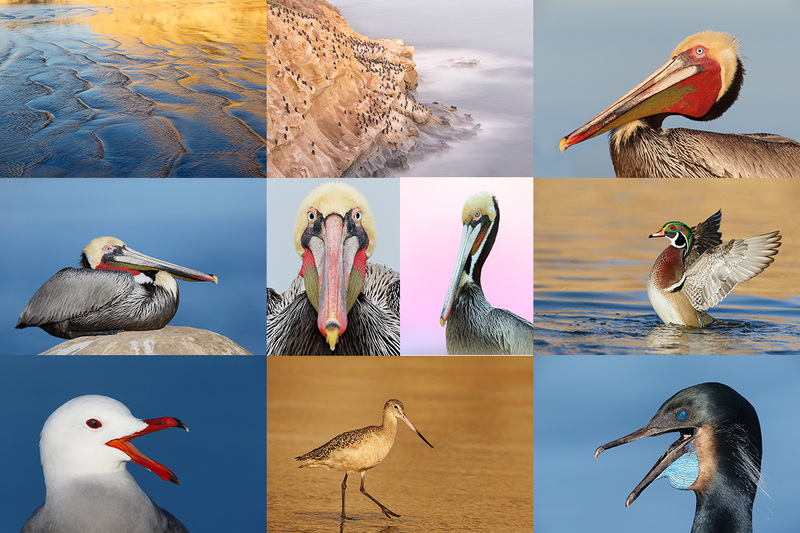 Should you specifically try to create head throw images or do you have a chance to get a great one in the course of a given morning of general pelican photography? Please note the answers to some of these questions can be ascertained by carefully reading the image caption above…. A good part of each morning on a San Diego IPT is spent considering all of the above questions…. And answering them. And lots more. If you would like to join us please scroll down for info on this great workshop. Click on the image to enlarge it. What words and phrases come to mind? Please take a moment to leave a comment with your list. Right now I have more than 20 on my list. I will share my list with you here on Friday morning. Did I miss the explanation of the new suggestion for using Giotto’s air blower for cleaning sensors? I thought it was going to be published yesterday, but did not find it there or in today’s entry? I ordered some Lens Pens from BAA, so I wanted to know the… latest scoop. Fresh water bird (woody) seems out of place. A poor effort I’m afraid; I was never very good at word association. I guess you would also associate the camera & lens combo, maybe the weather conditions. The patterns on the skin folds are very interesting. Do you have a close up taken with a longer lens? The picture on the back cover has more space than the one on page 86, is that full frame or still cropped? I disagree. You did well. I like the pitcher plant bit. I will post a bill pouch detail image at some point as you requested. Both are crops. Art directors are never very smart :).